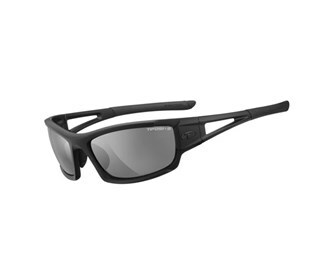 The Tifosi Z87.1 Dolomite 2.0 Matte Black Tactical Sunglasses are constructed with Grilamid TR-90, a homopolyamide nylon characterized by an extremely high alternative bending strength, low density, and high resistance to chemical and UV damage. These sunglasses feature hydrophilic rubber ear and nose pieces that are adjustable and provide a customizable, comfortable fit. Lenses are made from scratch resistant, shatterproof polycarbonate material that virtually eliminate distortion, give sharp peripheral vision, and offer full protection from harmful UVA/UVB rays, bugs, rocks, or whatever comes your way. The lenses are easy to install and detach, vented lenses improve air circulation, prevent fogging. The Tifosi Z87.1 Dolomite 2.0 Tactical Safety Sunglasses - Smoke/HC Red/Clear has many exciting features for users of all types. 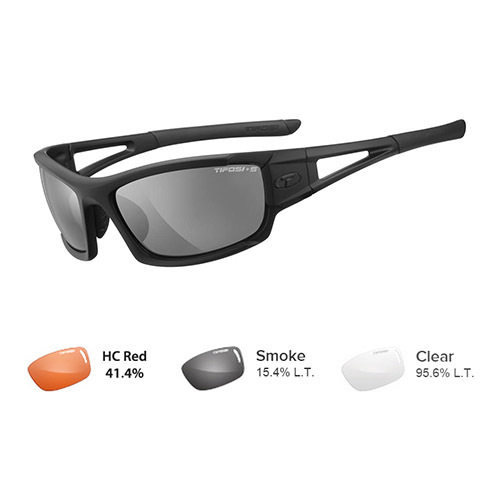 See the Tifosi Z87.1 Dolomite 2.0 Tactical Safety Sunglasses - Smoke/HC Red/Clear gallery images above for more product views. The Tifosi Z87.1 Dolomite 2.0 Tactical Safety Sunglasses - Smoke/HC Red/Clear is sold as a Brand New Unopened Item.